In this fascinating book, Helen MacEwan once more reveals herself as the current leading figure in the area of Brontë studies which concentrates on the time spent in Brussels by Charlotte Brontë, as a pupil and as an assistant teacher. Her well-known negative observations on Brussels and its inhabitants, and on Belgium in general, are rehearsed, embroidered upon and set in context, and the influence of her experiences in the city on her writings, particularly those relating to her beloved teacher, Constantin Heger, are examined in detail in a discourse which is both scholarly and accessible to less academic readers. 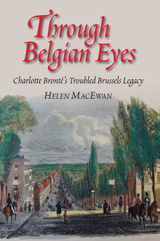 Less well-known ground is ploughed in addition: MacEwan has researched not only what Belgian commentators wrote about Charlotte Brontë, but what other literary figures thought of Brussels and the relatively new country at a crossroads of Europe in the nineteenth century. Many of their opinions were not too different to hers. Charles Baudelaire, in temporary exile from France, wrote posthumously-published notes about the ‘menacing stupidity’ and the boring ‘spirit of obedience and conformity’ in the country contemptuously named by Charlotte as Labassecour (Farmyard) in Villette, and thanked God he was born French. William Makepeace Thackeray wrote ‘…my impressions of this city are certainly anything but respectful. It has an absurd kind of Lilliput look with it.’ The writer and politician Edmond Picard recalled Brussels in the reign of Leopold I as ‘a provincial town that was slowly getting used to its role as a new capital… a town of quiet streets and sleepy squares with grass growing between the paving stones’, an account which, as MacEwan points out, brings to mind Lucy Snowe’s description of her excursion to the old Basse Ville to visit Mme Walravens, just one of many examples which indicate that Charlotte’s detailed descriptions of a vanished ‘little town’ Brussels are essentially accurate. The Professor and Villette are often valued by Belgian historians as sources of knowledge about the Brussels of the mid-nineteenth century, and not just its layout and buildings. A surprising amount of evidence appears to have disappeared. Charlotte’s time at the Pensionnat Heger is covered fictionally in great detail, and much of the fiction can be taken to match the facts of life in a girls’ boarding school at the time. MacEwan adds rich pages of information about comparable schools of the time, their regimes and their intakes. As for the citizens about whom she was so scathing and dismissive, especially her fellow pupils and the girls she taught as a sous-mâitresse, it could be that she got it right, in spite of the fact that she spent much of her time confined, stricken by boredom and loneliness, in a school which she considered to be a type of convent. She was not much of a teacher after all: evidence for this can be found in accounts of her early experiences at Roe Head School in Mirfield. MacEwan balances Charlotte’s negative opinions against those of others, including those of former pupils who actually enjoyed their time at the Pensionnat, which appears to have been, according to them, less rigorous and more friendly than other schools. So was Constantin Heger a little too friendly as a teacher, or just more or less in line with modern, less-authoritarian practitioners? He is arguably the most significant fictional brusselois in literary history. In a chapter with the title ‘Grande passion and petite pluie: Charlotte and the Hegers’ which will be read first by many, I suspect, MacEwan refers to Claire Harman’s biography, which was launched to coincide with the recent bicentenary. This begins not in Haworth but in Brussels. Charlotte, in her second summer, ‘depressed and tormented by her feelings for Heger’, is moved to confess to a Catholic priest in the Church of St Gudule. It ends in Brussels too, in the study of the 78 year-old Heger, who is writing a letter to another former pupil at the Pensionnat, Meta Mossman. Addressing her in affectionate terms, he includes: ‘Letters and the post are not, luckily, the only means of communication, or the best, between people who are really fond of one another…’ which has led some to speculate that he was flirtatious and to wonder ‘what else went on’ with Charlotte, who might have been one of many. Jane Eyre’s long-distance communication with Rochester comes to mind, and Lucy Snowe’s description of Paul Emmanuel in Villette: ‘his mind was… my library, and whenever it was opened to me, I entered bliss’. Of course, MacEwan weighs this against other views of Heger as a mediocre and unimaginative pedagogue. Whatever category he fell into, Charlotte created various versions of him in her novels, a fact unknown to those (the majority) who read just Jane Eyre, unaware of her experiences in Brussels. The portrayal of Madame Beck in Villette, probably based on Madame Heger, has been praised in Belgium, amongst other countries, as a masterpiece, full of psychological insights. Some who knew her recognised a number of similarities. Others, especially those close to Madame Heger, like her daughter Louise, thought of the portrait as a libellous caricature, and the whole novel as a work of revenge and ingratitude. Yet others detect a certain admiration as well as antipathy in Charlotte’s mind: Lucy Snowe compares Madame’s abilities to those of a police commissioner or prime minister. Here and throughout the book, MacEwan deploys all of the available evidence when dealing with autobiographical elements.